Copyright © 2004 John H. Betts - This image is copyrighted. Unauthorized reproduction prohibited. Translucent yellow-orange orpiment crystals up to 12 mm on matrix. 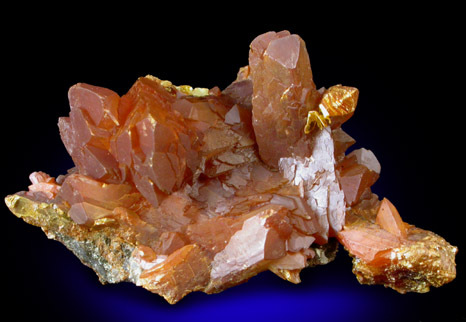 The orpiment crystals have minor scuffs on some outer edges, but are quite translucent with excellent color. Collected pre-1979. Overall size of mineral specimen: 4x2x1.5 cm. Size of individual crystals: 5-12 mm.